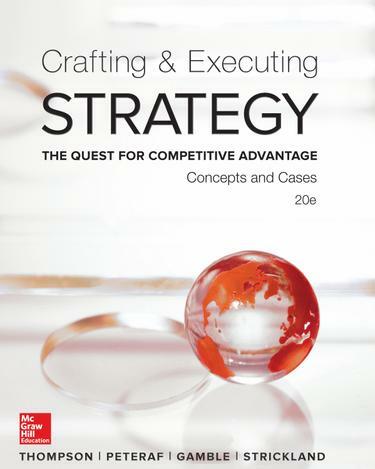 Crafting and Executing Strategy: The Quest for Competitive Advantage, 20e by Thompson, Peteraf, Gamble, and Strickland maintains its solid foundation as well as brings an enlivened, enriched presentation of the material for the 20th edition. The exciting new edition provides an up-to-date and engrossing discussion of the core concepts and analytical tools. There is an accompanying lineup of exciting new cases that bring the content to life and are sure to provoke interesting classroom discussions and deepen studentsÃ¢â‚¬â„¢ understanding of the material in the process.